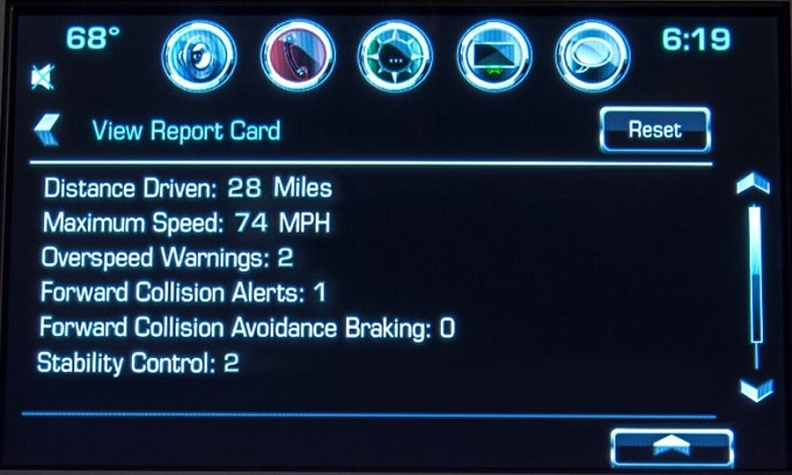 A report card issued by the 2016 Chevrolet Malibu's Teen Driver feature. Chevrolet will offer a new feature in the redesigned 2016 Malibu that aims to help keep teen drivers safer behind the wheel. Chevrolet says Teen Driver is the first feature in the industry to offer what is essentially a report card that allows parents to view on a display how their teens drive. Once active, Teen Driver automatically mutes the radio until the front seat belts are fastened. Parents can set the radio’s maximum volume to a lower level. Additionally, parents can select a maximum speed between 40 and 75 mph, which activates a visual warning and audible chime if exceeded. “The Malibu’s midsize segment is synonymous with what is commonly known as ‘the family sedan’ segment, which makes this feature very appropriate for Malibu,” a Chevrolet spokesman said. Motor vehicle crashes are the leading cause of death for teens in the United States, according to the Centers for Disease Control and Prevention. According to the Insurance Institute for Highway Safety, the fatal crash rate per mile driven for 16 to 19-year-olds in the U.S. is nearly three times the rate for drivers ages 20 and older. “We developed this system so parents could use it as a teaching tool with their kids -- they can discuss and reinforce safe driving habits,” said MaryAnn Beebe, a General Motors safety engineer. Parents can enable the feature by creating a personal identification number in the settings menu of their available MyLink system. The PIN allows parents or adults to register a teen’s key fob, which is critical because the system’s settings are turned on only for registered key fobs. Ford Motor Co. introduced a similar feature, MyKey, on the 2010 Ford Focus. MyKey is now standard on more than 6 million Ford vehicles, according to the company. MyKey also lets parents block explicit satellite radio stations and limit audio volume to 44 percent of total volume. A do-not-disturb feature blocks phone calls and holds text messages on phones paired with Sync. MyKey also allows for top speed settings of 65, 70, 75 or 80 mph, with chimes sounding at 45, 55 and 65 mph. The 2016 Malibu has optional safety features that, if equipped, are automatically turned on and incapable of being manually turned off when the system is activated. They include stability control, front and rear park assist, side blind zone alert, rear cross traffic alert, forward collision alert, daytime running lights and automatic light control, forward collision braking, traction control and front pedestrian braking. Teen Driver will be standard on the Malibu Premier and optional on Malibu LT models when equipped with the Convenience Package and up-level radio. The system is not a subscription-based service and will remain with the vehicle permanently. Chevrolet said there are plans to offer Teen Driver on other models. The 2016 Malibu debuts next week at the New York auto show and is expected to go on sale at the end of 2015.